Mid afternoon fairly busy with the stereotypical Spoonites associated with such venues including the pushchair brigade with their screaming accessories. Our group had finished a round of crazy golf early so decided to pop in here until the real pubs opened. I've only listed the non National Blands.. Brains - Bread of Heaven 4.00 Does what it says on the tin - alas on the tired side and a struggle to finish. First stop on a lunchtime outing. Wantsum - Ravening Wolf 5.90 Top pint. Hope the elephant keeps up this standard. Afternoon visit. Only 2 guests on in a pub packed with kids. Wantsum - Golgotha 5.50 Top quality and with a voucher well under 2 quid. Bargain.Nice to find an enjoyable beer here. Mid evening visit on way back to the railway station. A Margate sea front institution these days, waiting for the summer crowds due soon. Early visit for breakfast not many in. Westerham - Little Scotney Green Hop Ale 4.30 Superb example of a green hop beer and rarely for this pub in excellent condition. camra meeting with only one guest ale on! An appearance was made by the new manager of the giant Ramsgate spoons and his assistant. He was an area coordinator for Peterboro spoons and she was a manager in Cambridge spoons so plenty of experience being thrown at ramsgate and free tickets to the pre opening parties. Pity Im not around for opening! 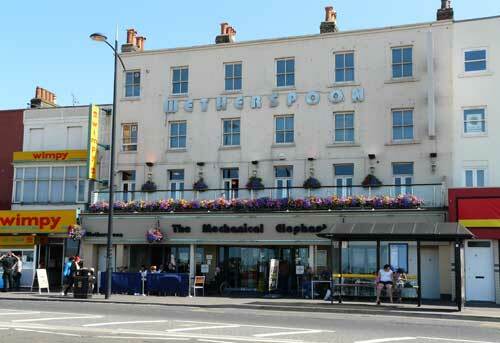 The pub is found in Margate, Kent, CT9 1XJ. Typical Wetherspoon's, although at one time was a Lloyds No.1 Bar at the weekend thus got pretty busy and had music playing loudly at the weekend. Since early 2013 the formerly dance floor partitioned off area for weekend music has been converted to carpeted bar seating to make this Wetherspoon traditional through and through. 10 handpumps in 2 banks of 5. We have visited this pub 73 times, seen 135 different beers and tried 71 of them.